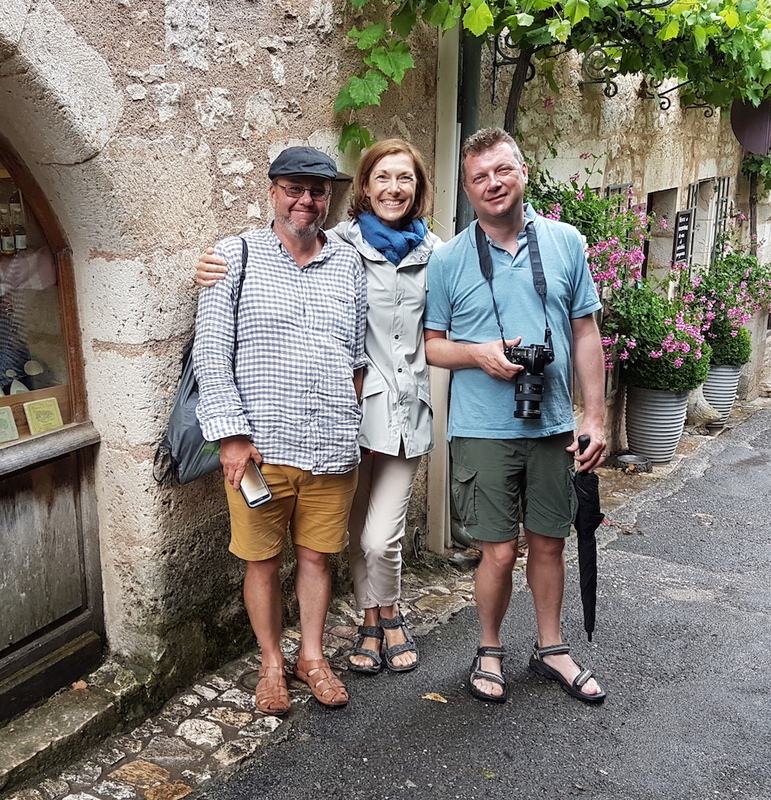 Following on from my last post … We had a marvellous time in Hourtin and met some lovely people. We were staying at a really nice small campsite that we had pretty much to ourselves and the pool was a godsend in the heat that we had. On the second day we were strolling around the town and noticed a big tent being erected in the square. It turned out to be a dinner and dance that evening so we put on our best outfits and went along. We sat on a table with some very friendly people and met a guy from Wales called Tim. The evening was huge fun and we danced like idiots all night. We became firm friends with Tim over the next few days. 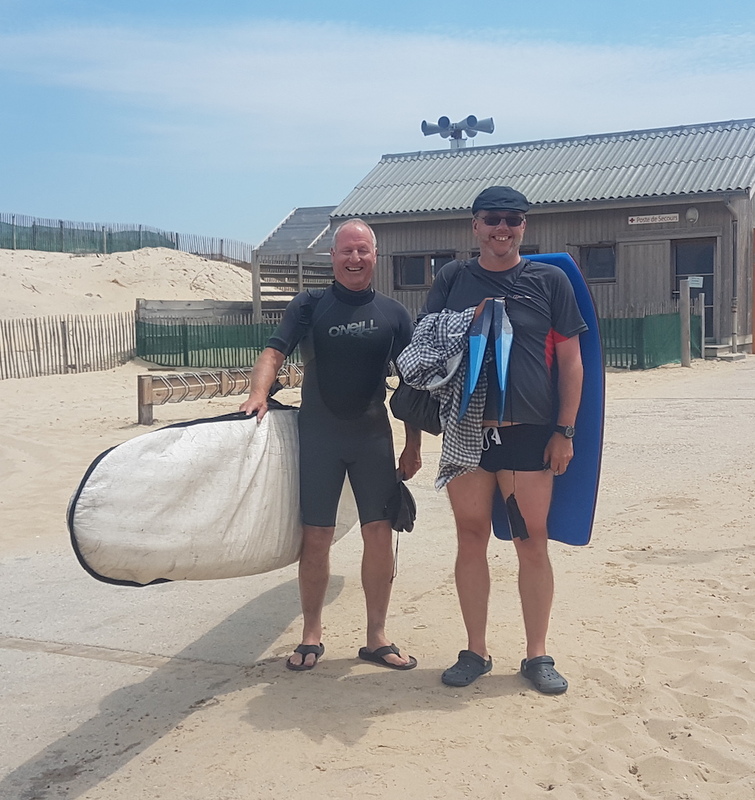 He invited us for dinner at his house and took us to the beach for a bit of surfing and we enjoyed quite a few beers together. However, eventually our new mat arrived and we had to leave. 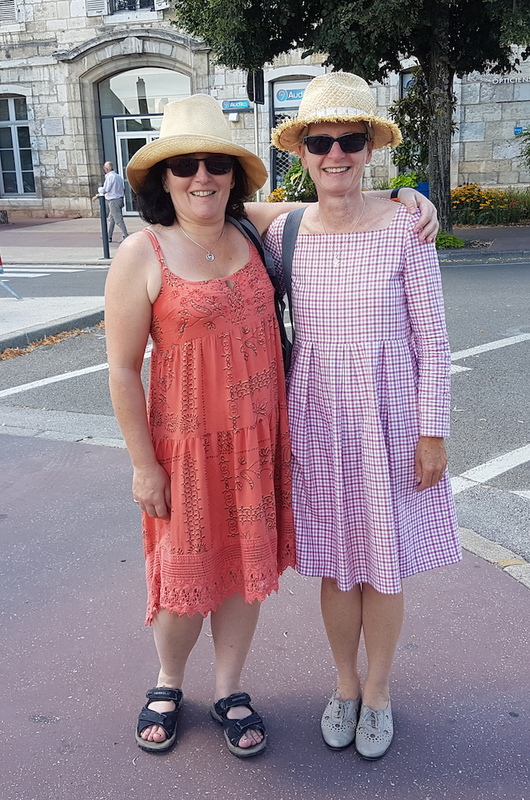 We were now seriously behind in getting to our rendezvous with friends in Cahors so we left as soon as the parcel arrived – this meant heading off for a 50km ride in the full midday heat of 38 degrees and rising! It was a very difficult ride and I felt quite ill that evening but at least we were moving again. That was followed by quite a few more long and very hot days but we managed to make it to Cahors in time. 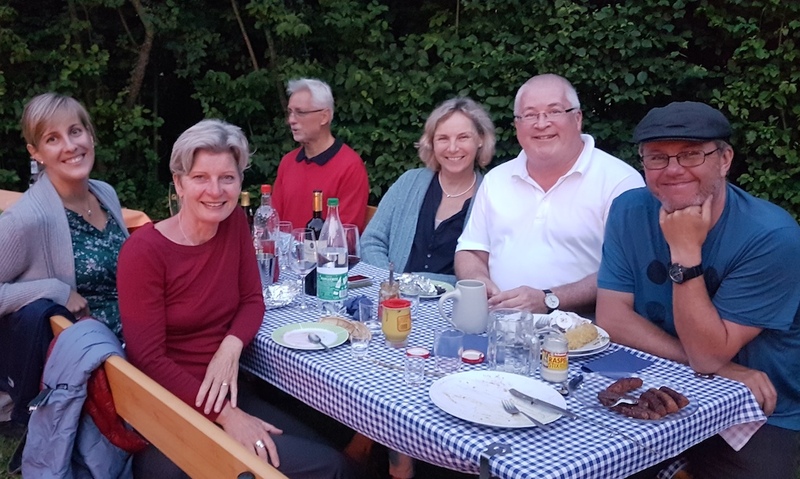 It was great to see our friends again and we had a really brilliant couple of days eating and drinking and catching up. And doing a bit of sightseeing as well. We had a really good time chatting, comparing equipment, sampling the local beer and food and strolling around the town. We now have serious coffee equipment envy – there are definite perks to having a large motor on your bike! Then it was onwards to Germany. We identified a route via Freiburg to get from the EV6 to the Danube that avoided Switzerland, which is very expensive. We also decided to take a train from Freiburg to Donaueschingen along this route as there was a particularly steep climb best tackled with a train. The Husband decided that he wanted to challenge himself by riding 120kms in one day – I felt no such compulsion. So we decided that he would head off and wait for me in Freiburg and I would do the same route over 2 days and stay in a hotel for the night. So all was set and we headed off early. I wished the Husband ‘Bonne Route’ and off he raced. I pedalled pleasantly along enjoying the scenery until at about 11am when I started to think about stopping for a ‘plat du jour’. I was merrily checking out the local cafes and restaurants along the route until I spotted someone who looked remarkably like the Husband. It transpired that he had stopped for a morning beer! 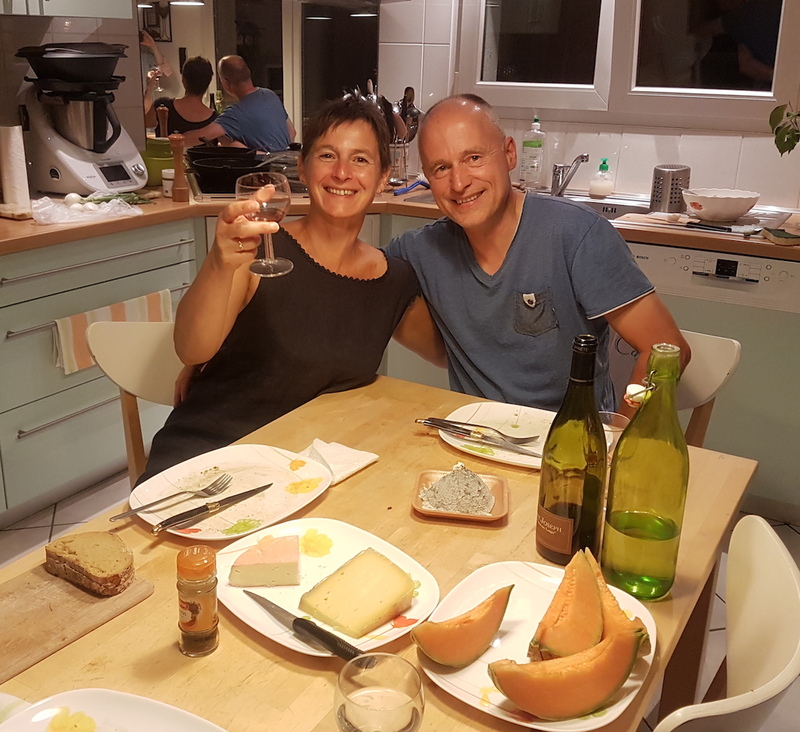 He then decided that the lunch I had planned sounded quite pleasant so we cycled on together and for a while and had a delicious lunch in Mulhouse. A couple of hours and several glasses of wine later, the Husband was still less than half way on his journey. We had also got chatting with some people on the next table who were having an English lesson with their teacher Cathy … and we had become part of the lesson. Very kindly, Francky, one of the students invited us to stay with them for the night. I gladly accepted but the Husband was determined to continue so I moved to their table, poured another wine and settled down for more conversation. The Husband headed off. I had a marvellous evening with Francky and his wife Corinne who were very generous and kind hosts. We spent the evening talking and eating and I had a wonderful time. The next day the skies had cleared and it was a sunny day for my relaxed ride to Freiburg where I found the Husband again. Freiburg was amazing and it seemed like everybody was on bicycles! Then we took the train to Donaueschingen and the weather changed significantly from hot and sunny to very wet and really quite cold. It continued for 5 days, by which time we were very waterlogged and muddy. During this time, we kept meeting up with a lovely french lady called Marine who was struggling miserably with a tent that wasn’t waterproof. 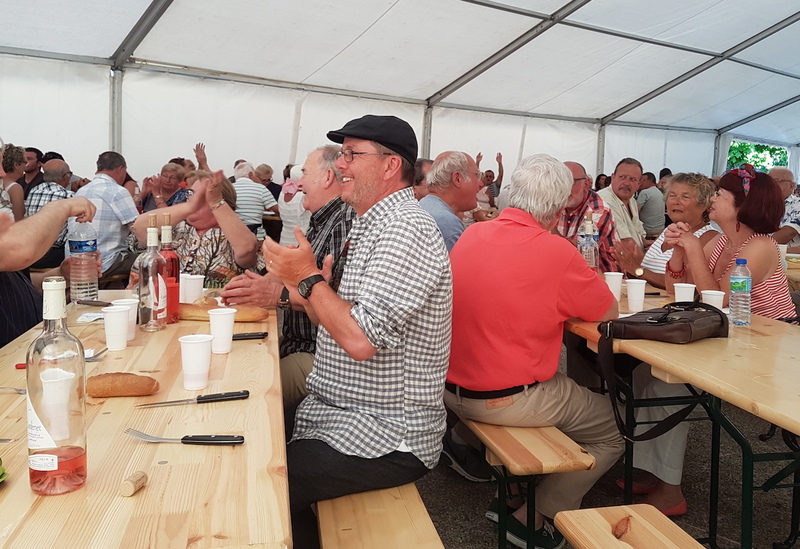 We really felt pleased that we had invested in a good tent, and the new addition (a large vestibule) which has worked out brilliantly as it gives us a place to sit and cook when it is wet. Tomorrow it is back on the road and according to the weather forecast there is a strong possibility of more thunderstorms and rain.